Prototype: German Federal Railroad (DB) "Hechtwagen" / "Pike Cars" compartment car, 1st/2nd class. Type AB4ü. The car looks as it did before the class reform of 1956. Use: Express passenger train service. Model: Era III. The car is constructed with many details and comes in the full length for the scale. The underbody and the swan neck trucks are specific to this car. The car is made to look as it did in Era III with a bottle green paint scheme. The 66719 lighting kit can be installed in the car. The car has NEM coupler pockets with a close coupler mechanism. Minimum radius for operation is 356 mm / 14-3/16. Length over the buffers 237 mm / 9-5/16. Hechtwagen / Pike Cars The First Standard Design Cars on the German State Railroad. At the start of the Twenties, when the decision was made to merge the individual state railroads into the German State Railroad Company (DRG), the managers were confronted with an almost unmanageable variety of rolling stock, which caused problems and higher costs in daily operation of a tightly managed firm. The decision was made to standardize both in the awarding of contracts for new locomotives and the purchase of new cars that were urgently necessary in the aftermath of the extreme demands placed on them in the war years. Emphasis was placed on massively lowering costs. Quick results were achieved in the area of passenger cars and as early as 1922 and 1923 the first all-German, newly developed family of cars was ready to be presented to the public: the family of Hechtwagen / Pike Cars constructed of iron. The name for these very reliable cars came from the wedge-shaped tapering car ends that were already in use on the Saxon State Railroad. However, it turned out that this unusual form was not an improvement either visually or technically and they were discarded in the building plans as early as 1928. 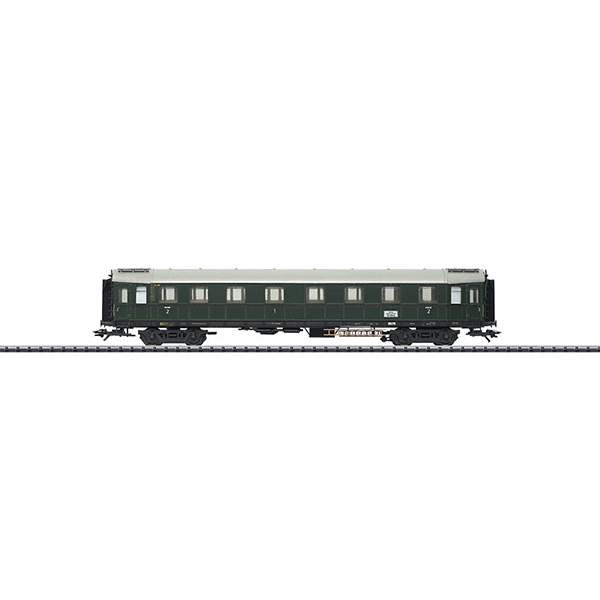 In addition to being constructed of iron - wood was used more and more only for interior walls and for lining the ceilings - another common feature of these cars was the layout of compartments with a side corridor, a sturdy barrel-shaped roof instead of the Prussian clerestory type of roof, ladders on the ends of the cars, and side windows with rather rounded corners. The cars were equipped with electric lighting and Knorr Kunze S type air brakes. In 1922, the car program included type A4u-23 car, 1st class, type B4u-22 cars, 2nd class, (both types were initially planned only for the Hapag-Lloyd trains), type AB4u-23a/b/c cars, 1st/2nd class, type C4u-23 cars, 3rd class, and type Pw4u-23 baggage cars. The latter did not have the standard length of 20,610 mm / 67 feet 7-7/16 inches; they were only 18,840 mm / 61 feet 9-3/4 inches. The baggage cars also differed in having Prussian standard design trucks. The other cars were equipped with trucks of an American design. The Hechtwagen or Pike Cars could be seen in daily service in express trains all over Germany. Their robust construction was so reliable that in addition to the German Federal Railroad taking over these cars after World War II, other railroads such as the German State Railroad (DR) or the Austrian Federal Railways (ÖBB) also incorporated into their rolling stock the cars still in their areas. The German Federal Railroad retired the originally German Hechtwagen or Pike Cars by the mid-Sixties. Similar designs of Polish origin were still in use for a few more years. Several Hecht cars were converted to maintenance cars and were even painted in ocean blue. AC wheel set 4 x 700150.